A celebrated chef and a gutsy DJ close out #NachoWeek with a battle royale for the first ever Viking Helmet of Nacho Excellence. Like so many good ideas before it, this one began with margaritas and mezcal. 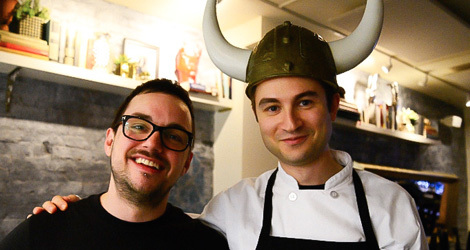 A couple weeks ago, First We Feast columnist and food obsessive Dieselboy was eating at Empellón Cocina, discussing FWF’s upcoming #NachoWeek with chef Alex Stupak. I had mentioned that it would be cool if Dieselboy wrote a column with the theme in mind, and suggested that maybe he should talk to Stupak about collaborating on a nacho recipe. It seemed like a good fit since the two are friends, and Dieselboy recently deejayed Empellón’s raucous holiday party. But like I said, mezcal got involved, and before you knew it a little friendly ribbing had transformed a potential collabo into an all-out battle royale. Suddenly, Dieselboy was agreeing to compete in a cook-off against one of the most talented chefs in New York City, and Stupak was agreeing to make a dish that, in his own words, “has nothing to do with what we do at this restaurant.” Pride and credibility were on the line, but the desire to talk trash and have a good time ultimately prevailed. And so it was the First We Feast Great Nacho Cook-off was born. Did it matter that neither competitor had actually ever made nachos before? Hell no. They both brought their A-games and created nacho riffs that might make you reconsider everything you thought you knew about the dish. Here’s how it went down. 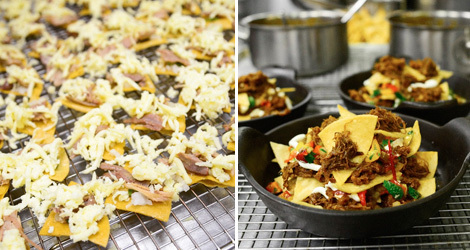 The first rule of the nacho cook-off is, there are no rules! This was not a Quick Fire Challenge, or a Ready, Set, Cook–style contest where everyone got a grocery store budget. The call-to-arms was simple: Do whatever it takes to make the best nachos you possibly can. 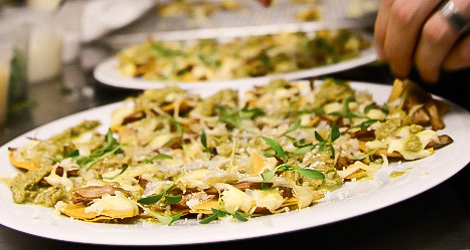 The main aim was for each competitor’s dish to represent his definition of the “ulimate nachos.” Scoring was designed to give proper weight to the most important aspects of nacho-making: Taste, scored 0-10, counted three times; creativity, scored 0-10, counted twice; and presentation, scored 0-10, counted once. DIESELBOY (LEFT): Dieselboy, né Damian Higgins, is a veteran DJ and seasoned world traveler who has a healthy obsession with food, cocktails, and cooking. Case in point: He once spent two years trying to get the recipe for the Torrisi Italian Specialties lasagna so that he could recreate it at home (that’s still healthy-level obsession, right?). Follow his FWF column here. 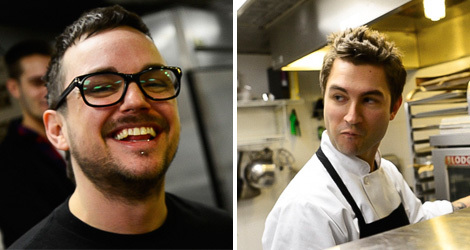 ALEX STUPAK (RIGHT): Before turning his attention to Mexican food at Empellón Taqueria and Empellón Cocina, Stupak made a name for himself as a pastry chef in some of the country’s top restaurants, including Alinea and wd~50. Read about the 10 dishes that influenced his career here (spoiler alert: none of them are nachos). 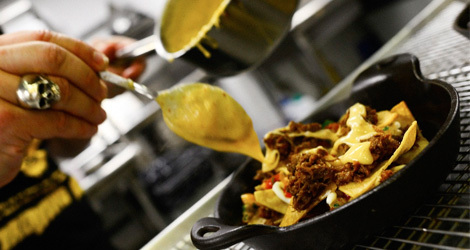 Nachos are really just a vehicle for deliciousness. 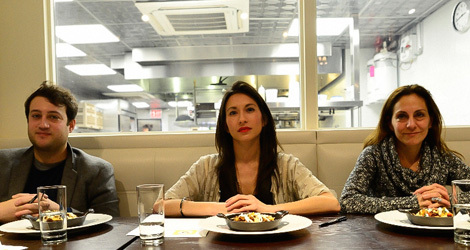 Don’t mess with these judges, they will f**k you up and then eat your nachos. Final scores: Taste: 63/80. Creativity: 46/60. Presentation: 19/30. Overall: 124/180. Final scores: Taste: 72/80. Creativity: 50/60. Presentation: 24/30. Overall: 146/180. Special thanks to the crew at Empellón Cocina for hosting the nacho battle, Alex and Damian for battling valiantly, and our gracious judges for giving up an afternoon for the pursuit of nacho perfection.